A century of struggle and sacrifice, with the KKE in the vanguard! Yes, the honored Communist Party of Greece has just completed a century of life and activity. We are proud to celebrate this birthday here in Piraeus, in the city that gave birth to our party at its 1st Founding Congress on 17-23 of November 1918. We are proud to celebrate together with all of you. Young men and women from every decade of the party. We particularly salute our veteran comrades who passed through fire and iron and are here today with us despite their health problems. We also salute the hundreds of young men and women from KNE, aged 14 to 18, who joined our ranks this year. We embrace with special joy our very young friends who are united under the aegis of the magazine "Kokkino Aerostato". 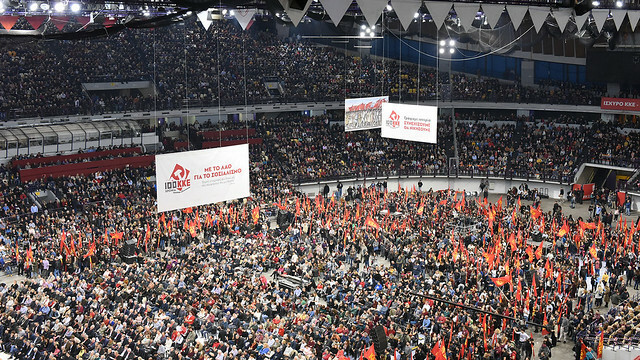 We are proud and its is a special honor for us to have with us and to celebrate together with our comrades and representatives from 91 Communist and Workers Parties from every corner of the planet, who are struggling for a better life in every country, continent, all over the world. The KKE since the day of its founding has been true to the principle of proletarian internationalism and expresses its internationalist solidarity in many ways. We honor the militant men and women from every country in the world. We honor the memory of the comrades who have departed us, such as Fidel Castro, leader of the Cuban Revolution, today being two years since his death. We have already entered the new century with our symbols, the hammer and sickle, with our principles, with the Marxist-Leninist, communist ideology, our contemporary programme and with the red banner high and fluttering in the wind: "Proletarians of all countries unite!" We have already entered the century which is the era of the necessary passage from capitalism to socialism. In an era in which various people told us and continue to tell us that "the decaying world where it decays can be renewed, and our uprisings are basically obsolete." However, the history of the implacable class struggle refutes them. The red carnations, the slogans, the flags, the raised fists refute them as does the song today of the youth "who do not accept injustice." The 100 year history of the Communist Party of Greece refutes them. The thousands of well-known and anonymous people who with their struggles wrote this amazing history page by page. We honor all those who humbly and quietly wrote that "we did not do anything important". We are grateful to each of them who stood upright over these 100 years. All those who as Dimitris Chatzis wrote in his novel “Mourgana”. "They believe in their just cause and for this reason they fight well. They are conscious of their duty and for this reason they are disciplined in their group and die when necessary. Through the harmonious life of the disciplined group, the heart is peaceful and the spirit is balanced. They love their country, their homeland, they yearn for victory. They are down to earth and happy. This is why they sing so much. They love life, its fruits, peace. They are calm and sensitive. This is why they are easily moved and cry at the drop of a hat. This is how they all are. They fight well, they sing a lot and cry easily." In this difficult period, the KKE is obliged once again to raise the sun high again, to raise the workers up. And in the past we understood it was not enough to sing "Help to raise the sun a little higher", we had to raise it on our shoulders. We had to write new songs. And this is was done by thousands of young communists who took on and held the baton from the older communists of the first communist cells. the militants of EAM and ELAS, the fighters of the Democratic Army of Greece, from all those who endured the stone years, the dictatorship, all the turns of the class struggle. We held this baton tightly, it did not fall from our hands. For this reason, when the red flag was taken down from the Kremlin, we shouted "Comrades, raise the flag high, hope is to be found now in the struggle of the peoples." We swam against the tide, we closed our ears to the sirens, we upset some friends and comrades who wanted "softly, softly..", who asked us to put water in our wine. We did not do it and it has been demonstrated that we were very right not to, because we knew that in the end there will be only water in the glass, murky and dangerous. And we did not do this, because our party with its hundred years of experience, does not have the luxury of making mistakes that will set the movement back, that will hinder its ability to regroup, to counterattack, to move forwards and to target the barbaric power of the exploiters. "Worker without you no cog can turn, you can do without the bosses." With this slogan we speak daily to the hearts and minds of the workers, unemployed and toiling people today. Today when every word of the KKE is being borne out by life itself, we are proud because in difficult times we did not retreat. Because we followed the same life stance of thousands of militants. We are proud because we signed no statement of recantation to the system of exploitation. We are proud because we were consistent with Lenin's phrase: "We must tell the truth again and again even when it is unpleasant." We continue to say many truths. We reveal that bourgeois parliamentary democracy is a form of the exercising of capitalist power. It cannot hide its character and content, that it is in reality the dictatorship of capital, the dictatorship of the monopolies. Because, regardless of the form that the political system takes, the state remains a class-based anti-people one, oriented to intensifying the exploitation of the working class and the oppression of the popular strata both in the phase of the capitalist economic crisis and in the phase of capitalist growth. And this of course did not change in the years of the so-called left government. Quite the contrary. The experience of our 100 year history gives us the ability today to have a stable ideological-political front against any form of the dictatorship of capital, and of course the Nazi-fascist form. We must reveal that the bourgeois class and its parties do not restrict themselves to bourgeois democracy which they themselves established with the limited bourgeois legality. When they consider it necessary, they use military and political coups, suspending their own laws, in order to intensify state and other form of violence and repression, restriction of political and trade union freedoms. We told the truth about SYRIZA, before it entered government and took its place next to the parties of bourgeois management in order to continue the same anti-people path. We warned that every bourgeois government, regardless of the slogans, intentions, name, will be inherently anti-people, the same as and worse than its predecessor, because the power of the monopolies becomes worse for the people and consequently its organs, its governments will follow suit. Life itself is proof of this, in terms of the rights of the working class. The balance that shows the losses of the working class, the people, is weighed down to the bottom, because the salaries and pensions are at the bottom, as well as social security and labour rights. And the more burdens are thrust on the people, the more the profits of capital increase. And SYRIZA in the four years of its government foisted a third memorandum on the people, hundreds of anti-people anti-worker laws, bloodstained surpluses and a debt that will be shouldered by generations yet to be born. And all these things will be paid for by the working class, i.e. the economic crisis as well as the antagonism of capital in the Balkans, Europe, globally. This how the balance of capitalism works: when the working class loses, capital wins. SYRIZA implemented the demands of capital one by one and boast today that its government succeeded where the others failed. It lowered even further the level of demands of the people who in order to survive the crisis had accept crumbs, to settle for very little. Indeed, the recent-in Tsipras’ words-vindication of the memorandums, the greatest insult to all those who in the previous years fought, opposed the anti-worker measures, defended their rights and gains, is part of its contribution to the system. It invests in disappointment, fatalism and compromise because it wants to restrict and break the labor-people's movement. It wants the movement to remain within the boundaries of the system, with “realistic” goals i.e. within the boundaries of poverty and to postpone any struggle for radical changes to the Second Coming. SYRIZA which took the position of social democracy in the bourgeois political system, maintaining its opportunist, adventurist core, demonstrated that it could fulfill this mission more easily that ND and the bankrupt PASOK. Its governments proved more effective for capital, for the bourgeois class, the EU and the USA. Chiefly due to its capacity to blunt the people’s resistance, to manipulate radicalism, to corrupt consciousness. In any case, for this reason it enjoys the full support of capital, which of course will have no problem in supporting again a ND government, when SYRIZA collapses. The fake dividing lines in its confrontation with ND serve their joint effort to conceal their convergence on strategic issues, which are what in the end are crucial for the life of the people. Neither the distinction between the “old” and “new” political system, nor the false dilemma “progress or stagnation” can hide that SYRIZA and ND together with other bourgeois parties compete over who can serve the power of the monopolies more effectively. It is provocative to present as “progress” the governmental proposal for a revision of the constitution, which has as its basic goal the stabilization of the system and its governments, regardless of the parliamentary majority of one party, to safeguard the continuity of the bourgeois state’s mechanisms, regardless of the alternation of the parties in government. This is the common aim of both SYRIZA and ND so that the implementation of the anti-people political line is not disturbed. Of course progress is not the prettifying and renewal of the corrupt political system, which the people have lost their trust in. Progress is the utilization of any difficulty, rupture and instability in the barbaric system so that the people can put a halt to its anti-people work, hinder it, to win time to organize their counterattack. Progress in the end is the intensification of the people’s opposition and discontent with the rotten bourgeois political system and this discontent must meet with the political proposal of the KKE. The strength that can halt the rise of the far right, Nazism, fascism is to be found in the political proposal of the KKE, its strengthening, the regroupment of the labor movement, the reinforcement of the social alliance. Not in the various “fronts” and “alliances” of SYRIZA, which tries to set new traps for the people who have lively and militant traditions and the will to act against the far right, Nazism. The rise of the far right, nationalism cannot by halted by those who are the flagbearers of NATO, because NATO itself reinforces nationalist, even fascist forces in order advance the policy of “divide and rule”. It cannot be halted by those who sign agreements allegedly to resolve the name issue, but in essence to advance the integration of neighboring FYROM into the predatory NATO alliance, leaving the window open to irredentism, fertilizing the terrain for nationalist forces in our country to foster their own irredentism with the well-known ahistorical slogan : “There is one Macedonia and it is Greek”.. The rise of the far right, nationalism cannot be halted by those that whitewash US imperialism at every opportunity, who call Trump (who was supported by the Ku Klux Klan) “devilishly good”, who pose for photos with Nazis of Golden Dawn in Kastelorizo and bear the main responsibility for the unacceptable delays in the trial of the criminal organization of GD, which means that Nazi criminals still walk free. In any case it cannot be those who receive good grades from the mechanisms of the EU, which has anticommunism as its official ideology, the antihistorical theory of the two extremes, the equation of communism with Nazism. The KKE does not mince its words about the EU or any other imperialist alliance. From the very first moment it exposed its character as a union of the capitalist countries of Europe. It does the same with NATO, this murderous imperialist machine of wars and interventions. Today more workers, people from the popular strata understand that this EU does not change, cannot become pro-people, pro-worker, it is and remains deeply reactionary. It was such when the KKE warned about its predecessor the EEC, later about the Maastricht Treaty, the memorandum of memorandums. We did not celebrate about EMU and the Euro, as today’s eurosceptics did. It remains reactionary, whether social-democratic, neo-liberal or far right forces are on the rise. Because its basic goal is the buttressing of the profits and competitiveness of the monopolies of its member-states, through the merciless international competition. And this goal is fulfilled by brutal constant offensive against the working class in order to further the reduce wages and pensions, the workers’ income, so that the monopoly groups become stronger. The constant offensive against the working class and its rights is a normal situation in all the EU countries, whether they have memorandums or not. And in Germany which is the EU’s engine and in France and Italy and also in countries like Greece, which remains in a very weak position due its high debt. Today more people understand what the KKE means when it speaks of predatory alliances. Because there was never and there never can be equal relations between the member-states in the EU, as the solidarity amongst the monopolies is only related to their agreement to attack the peoples. As in every imperialist alliance, uneven development prevails inside it, competition, the unequal relations between states. And the competition between the major powers of the EU, France, Germany, Italy, continues, making its future increasingly uncertain. Indeed the forecasts are not good for the European and also the international capitalist economy. The possibility of the outbreak of a deeper crisis of capital overaccumulation is real. There was no very dynamic upswing since the crisis of 2008, and this is reflected in the accumulated international debt, in the financial tricks in order to increase profitability, in the relatively limited private industrial investments, especially in capitalist economies like the USA and Britain. Imperialist centers resort to the tools of so-called protectionism-like those measures being taken by Trump- in order to buttress their monopolies. And thus the contradictions are sharpening, the social problems increasing.. The promises of SYRIZA and ND about “calm long term” capitalist growth are fairytales. Similar dangers spring from the increasing involvement of our country in the plans and interventions of the USA and NATO in the region, which ND and the other parties of the two bourgeois poles in essence agree on. The only disagreement between SYRIZA and ND is who is more NATO than NATO! Who is the best at whitewashing US imperialism? ND and PASOK who for years have been telling us that the US are our friends and gave them “land and water”, or SYRIZA who dealing with two US Presidents, Obama who gave us lessons about democracy and then Trump, broke every record of brazenness, gave new bases, ports, airports, shipyards and other facilities for the needs of NATO and the USA? SYRIZA and ND have supported the dangerous decisions of NATO that consist of war preparations against Russia, the upgrading of its plans including the use of new ultra-modern weapons of destruction, amongst them nuclear weapons, they have increased military spending to the outrageous level of 2% of GDP. SYRIZA and ND play the same game regarding alleged security and stability that the participation in dangerous imperialist plans provides our country, our people. They argue over who will hold the flag of NATO and the USA, who will have the closest relations with the US ambassador: SYRIZA who has taken him round all the ministries or ND and PASOK who have give him a “free pass” to every region and municipality where they are in the majority? And while the region, from the Balkans, Aegean, to the Middle East and Eastern Mediterranean smells of gunpowder, the parties of bourgeois management are arguing over who will better serve the interest of the bourgeois class in the region. Over which of the two will safeguard a share for the Greek monopolies. And in this region where everyone has jumped in to try to seize its wealth. In this tough competition are the USA, NATO, EU countries, like Germany, France, as well as Britain, Russia, China, and also regional powers like Turkey, Israel, and others. Our people cannot wait for the sirens of imperialist war to sound. They must rise up now and strengthen their struggle against imperialist war. They must demand that Greece not be used as a launching pad of the imperialists. The Souda base must be closed and all the other foreign bases in Greece. Greek soldiers must return home from missions abroad. Our people cannot expect in a utopian way for NATO to dissolve itself and for the EU to become a Europe of the peoples! They must now strengthen their struggle for disengagement from the EU and NATO, as well as from every imperialist alliance with the people masters of our homeland, in charge of society and the economy. Because if the peoples in every country were really the masters of their own lands, with the keys of the economy in their hands, they would find the way to resolve their differences to the benefit of their common popular prosperity. The KKE devotes all its forces, plays the leading role in the struggle against imperialist wars and interventions, has its 100 year history as a legacy. It has written heroic pages for the interests of the working class and the popular strata. In difficult hours it will play the leading role in the struggle for the defense of the territorial integrity and sovereign rights of our country in order to crush any foreign invader that dares to attack Greece. However, at the same time, the people must not have any faith in the bourgeois government, which bears enormous responsibilities, because it gave everything to capital, the EU and NATO. No toleration of or support for the ruling class that participates in the war to advance its own economic interests. The working class, our people, must finally be victorious and build their own working class power, the socialist society, which is the only way to eradicate the causes of imperialist wars. Only in this way can the people and their children live in peace, with work, with high level education. This is the way to abolish exploitation, unemployment, poverty and wars. Can we and our children live better? We answer categorically: YES, WE CAN. Because our country today has major unutilised productive potential that can only be liberated through the socialization of the means of production by workers power, with central planning of production and workers control at every level of organization. Because our country possesses significant domestic energy resources, mineral wealth, a specialized labor force and means in order to support industrial and agricultural production, to directly cover the majority of the people’s needs, i.e food, energy, transport, the construction of infrastructure and people’s homes. Agricultural production can support industry in various sectors. There are preconditions for the satisfaction of the contemporary needs of the people, not just the people’s needs in general, with a radically different organization of the economy and society. The way it is: the socialization of mineral wealth, energy, telecommunications, transport, retail, land, the capitalist agricultural businesses, natural resources. They must all become social property. With these tools workers’ power can plan the economy centrally, lend impetus to the development of the sectors and the regions, to accordingly develop agricultural, industrial production, social services based on the criterion of the satisfaction of the people’s needs in an increasingly broad way. This centrally planned economy, on the basis of the social ownership of the means of production, is the only one that can provide a final solution to unemployment. The abolition of business activity in health-care, welfare, education, culture, sports, the opening of exclusively free public, high quality and modern social services. The protection of maternity, children, the elderly. The creation of the preconditions for free time for all workers, especially for women. Measures to favor women’s participation in the organs of workers’ power, from the base to the top. Workers’ and people’s participation, control, will begin from the units of production with elected recallable delegates and will be extended to every sector and region. Apart from workers and cooperative farmers, students and pensioners will also be represented in the elected organs of power. Even in the highest organ of power for the whole country, elected delegates will not be permanent but recallable. This in brief is our plan, our proposal for the people. And this proposal is realistic and necessary because it is in the interests of above all the working class, the people. Because realism and necessity are above all for life and prosperity to be in step with the progress of science and technology. The people and youth should enjoy contemporary needs. The clock should not be turned back for the younger generations to live worse than the older ones, because in the name of realism rights and gains are being deleted, with the entanglement in new war dangers. The new world of socialism-communism is what is realistic. We have already set our course in the new century because we read, studied, assessed the past century with the mistakes and weaknesses, the ups and downs, we corrected injustices and mistakes made in this difficult course of ours over the last 100 years. We looked the socialism we knew in the eye, we did not throw the baby out with the bathwater, we spoke of the real problems in socialism, and when they were holding up Lenin and Stalin as “monsters”, we demonstrated why the counterrevolution prevailed, why this historical setback came about, certainly a temporary one, for the course of humanity forwards. We learned about the new plan that is required. We worked exhaustively and in a detailed way regarding the content of central scientific planning in our programme. We insist that for many decades now the capitalists and their class are useless, that the workers can become the scientists and managers of their lives, that our children can become agronomists, engineers, builders of the new life, musicians of the great compositions of the new socialist world. We showed the "beautiful city" of the human producers. We were not enchanted by the palaces of the plutocracy. We held on to life, we flew the red flag in the darkness, we said with certainty that "there is much more for us to experience.."
In the years that passed, in the centuries that passed, however implacable and barbaric the system of exploitation seemed, there were popular uprisings, heroic figures, a Spartacus that pushed society forwards. The defeat of the Commune in 1871 may have relieved the bourgeois class and in the face of the next revolution of 1905 they may have put a Father Gapon at the head of the demonstration but they could not prevent 1917. They could not stop the days that shook the world. Today the descendants of the black marketeers who growled that " we cannot oppose the 3rd Reich" demand that the KKE ceases to talk about imperialism and show the way forwards. They demand that the KKE becomes like them, a fan of TINA (There Is Νo Αlternative ) … what a cheek, what a nerve!!! They forget-you see that the hunt for profits does not afford them the space for deep thought- that this party has a long history and a clear objective. Because its objective is the emancipation of the working class. In any case we are deeply convinced, we know that it is inevitable that the capitalist system will decay completely. Our duty is that we must nit let become even more deeply barbaric. Revolutions do not happen just because a vanguard wants it. Revolutions, however, can be victorious when the vanguard exists. We are building such a party, capable of being in the front line whenever the hour demands it. Many of those who in the previous years faltered are marching forwards next to us in the new century. We are absolutely certain that the KKE will be there choice when the seas become stormy, when it will be necessary to fight back the oppressors, dynasts, exploiters, until this unjust world becomes a thing of the past. Our duty is to leave no moment wasted without carrying out our tasks, without having contributed to the extent that people give us strength. So that the working class rises up. This is our raison d'etre, their final emancipation which will liberate the rest of the people. “this pirate ship, we will sink it, and while the Devil may rage, we will build free world, open and full of hope." "Don't expect us to bend even for a moment like the cypress tree in the storm."